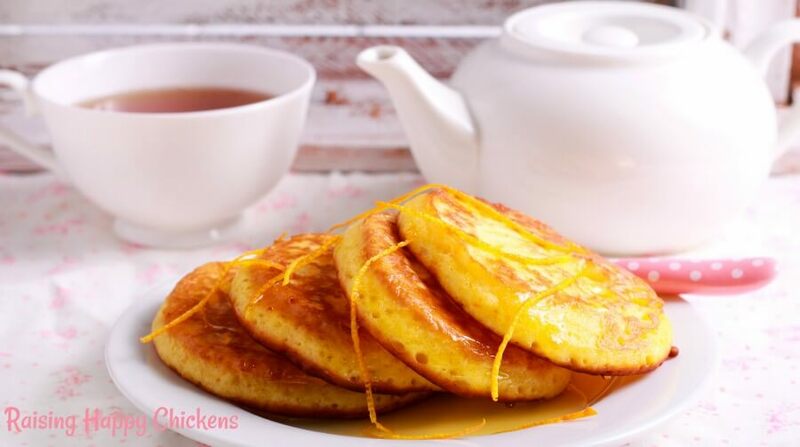 Scotch pancakes : an authentic, inexpensive, delicious recipe. 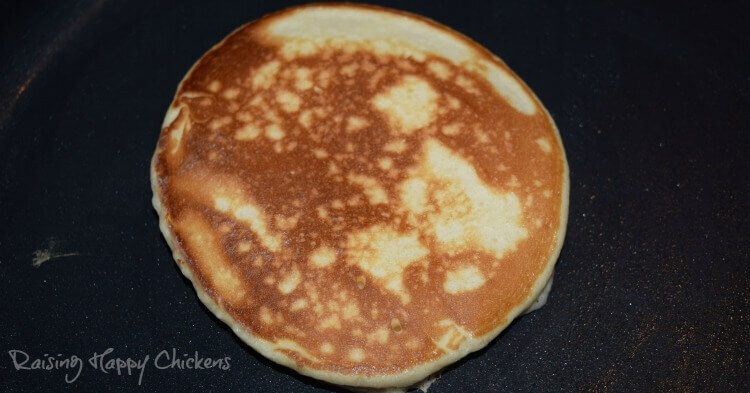 Traditional Scotch Pancakes: an inexpensive, easy recipe. Always wondered what Scotch pancakes are and how to make them? You're in the right place! As well as having a home in Italy, where I spend most of my time, I now also have a home in Scotland, UK. So it's only natural that I would want to share with you a traditional recipe for Scotch pancakes. They're so simple and quick to make, taste delicious - and they're a great way of using your girls' delicious, healthy eggs. They're also very inexpensive to make, particularly if you don't need to buy the eggs! What exactly are Scotch pancakes? Also known as drop scones, they're very like the pancakes I've had for breakfast in America. Thick, quite small, sweet and very light, they're different to the English version - which in America would be called crêpes. In America these are usually eaten in the morning with syrup and sometimes fruit. But in Scotland, Scotch pancakes are generally eaten at tea-time - mid to late afternoon - with butter and jam (jelly in the States - how confusing language can be!). They were (and are) often used as a quick and cheap sweet to offer if someone pops by unexpectedly for a mid-afternoon cup of tea and there are no cakes in the store cupboard. 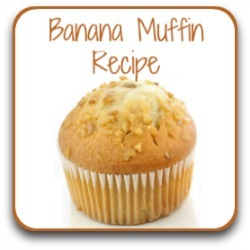 The recipe is so easy that they can be made while your visitors sit and chat. And the fact is, they're good at any time of the day! What's needed to make Scotch pancakes? 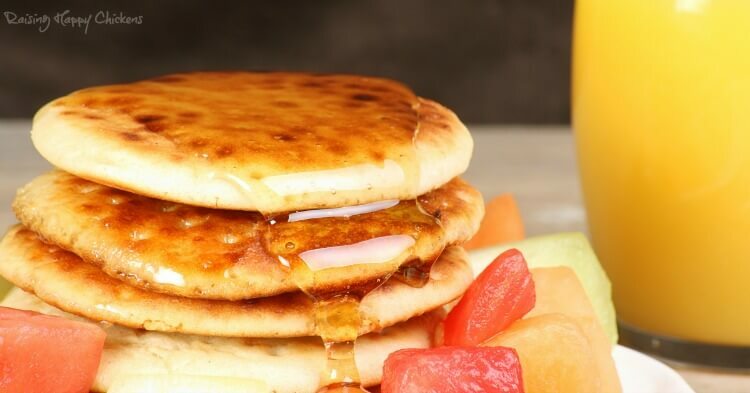 Eat them American style - for breakfast, drizzled with honey and topped with fruit. The ingredients for this recipe are very simple - there are only four. Most importantly, though, you will need a griddle pan with a very heavy base. Why? Because to cook the batter properly, it needs to be on a very high heat. Thinner-based pans just don't work as well. I personally use this one - in Scotland, it's known as a "girdle". 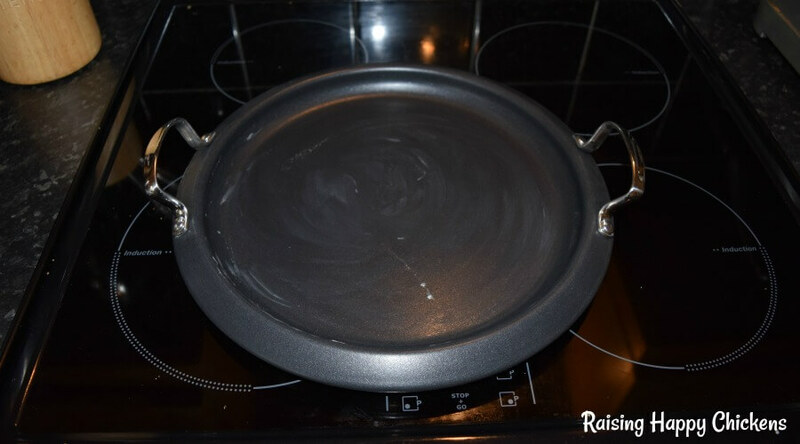 It's a stainless steel griddle pan with a non-stick cooking surface - and I love it! I use it for a whole variety of recipes - it cooks pizzas perfectly! You can click here or on the pic to buy it now if you don't have one. I can tell you for certain, it will make your life soooo much easier. This is one of my favourite cooking pans - we use it for so many things! Scotch pancakes : recipe ingredients. This recipe makes about a dozen, depending on size. If you want fewer - or more - it's easy to change the ingredients. Simply make sure you use double the amount of flour to sugar, and alter the eggs and milk accordingly. N. B. : In the USA, where self-raising flour is not as common as it is in the UK, use the same amount of plain flour and add one teaspoon of baking powder as the raising agent. 2 medium or large fresh eggs. There's a free, print-friendly download of this Scotch pancakes recipe available here. Set your oven to a warm (not hot) temperature. This is just to keep the pancakes warm once they're made. In a large mixing bowl, sieve together the flour and sugar. 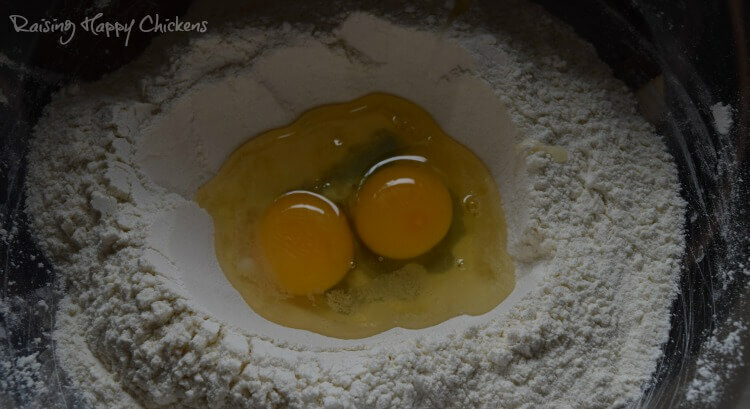 Make a well in the centre of the flour and drop the eggs in. There's no need to beat them beforehand. 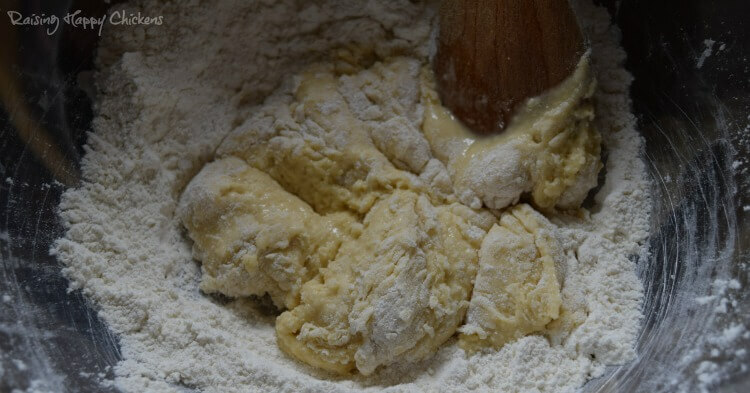 I use a wooden spoon to combine the eggs and flour, which I find makes the batter less lumpy. But you can use a hand whisk for an even faster result - the lumps should come out later, when you add the milk. Starting with the flour nearest the eggs, mix the flour in bit by bit. The batter at this point will become quite lumpy and dry. That's entirely normal. When it starts to become so dry that it breaks apart, add in the milk, a little a time. Don't be tempted to add it all at once, because you may not need it all. 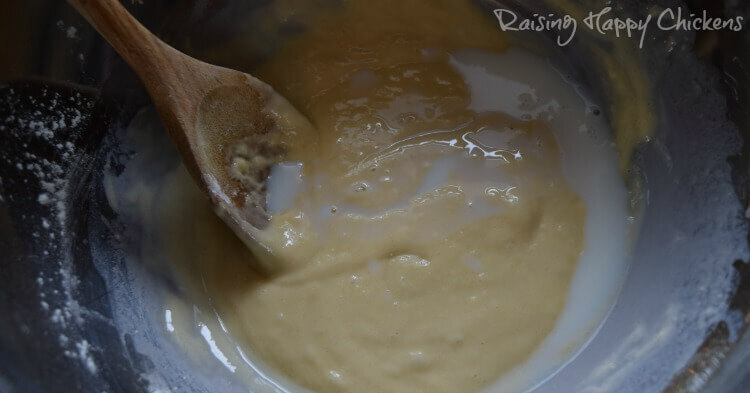 Keep adding the milk until the batter becomes about as thick as a double cream, so it drops off the spoon (or whisk) but isn't anything like as runny as water. 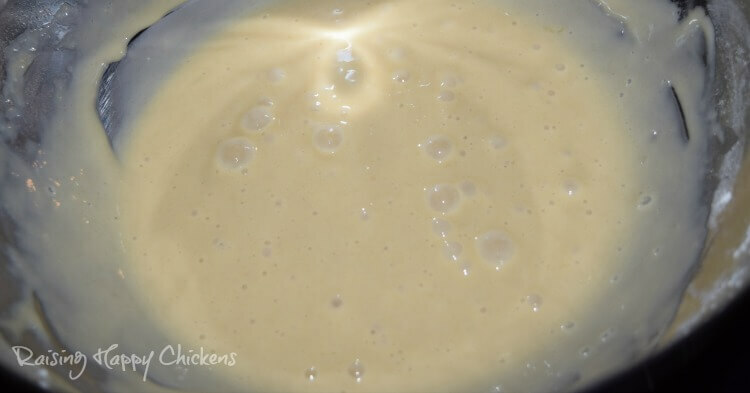 When your batter has this consistency, it's ready to use. Don't be tempted to add too much liquid. Now take your pan. 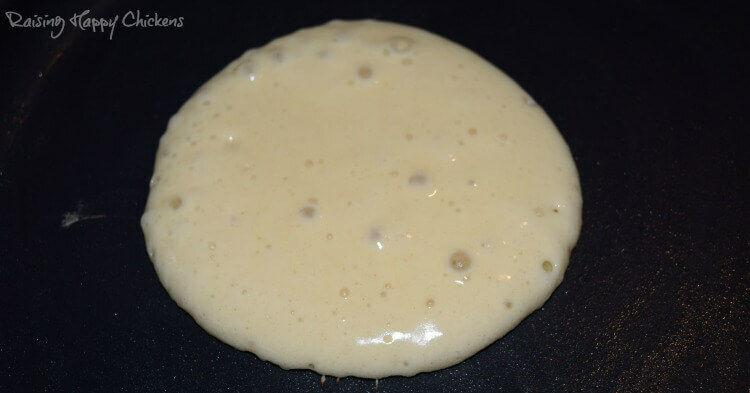 Remember: it needs to have a thick base so it can be very hot - this is critically important for a good pancake! Lightly grease the base, and place on a high heat setting. I start off with induction setting number 7, reducing it to 5 or 6 as the pancakes cook and the griddle gets hotter. 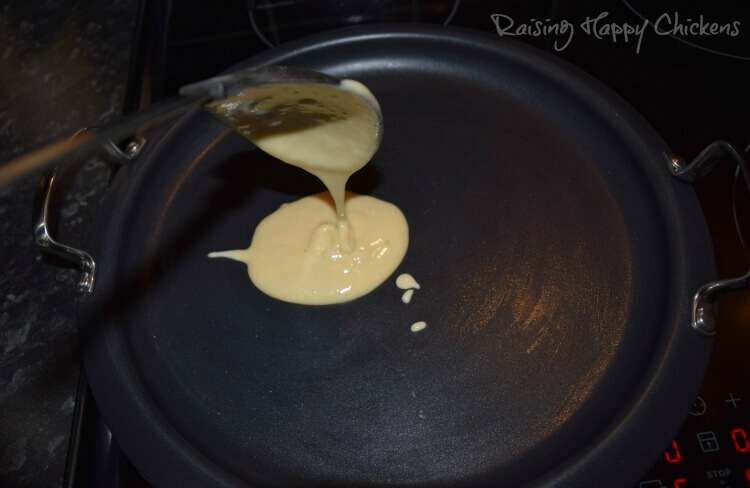 Once the pan is hot, take a spoonful of batter and allow it to drop onto the griddle (this is where the name "drop scones" came from). Don't worry about the shape - it will miraculously become round. If you're really picky, you can nudge it into an even rounder shape with your spoon. 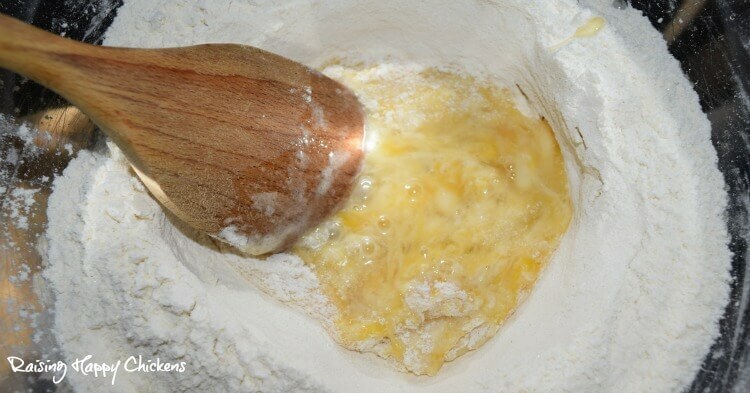 Don't use too much - it will cook unevenly if you do, so the outside will be cooked but the middle will still be batter. This was one of my early attempts - too much batter on the spoon, so it splattered all over the pan. The outside was cooked, but as you can see, the inside was not! Once the batter begins to bubble, it's time to turn it over. Don't try any fancy flipping - just a gentle turn will be fine! Leave the flip side to cook for no more than a minute or two. 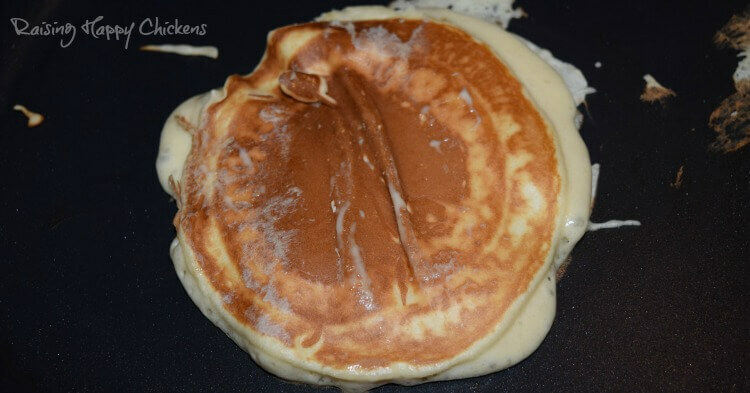 As your griddle pan gets hotter, the pancakes will cook much more quickly so be careful not to over-cook them. This is what it should look like on the cooked side. Once it's cooked on both sides, put it to warm in the oven while you make the rest. As you become more used to cooking them, you'll find you can make them look neater. But it's not a battle to create the perfect shape - this is supposed to be fun! Now all you have to do is decide how to eat them! Drizzle them with syrup, coat them with icing sugar, top them with fruit - the choice is yours! This is the traditional way to eat Scotch pancakes in Scotland - warm, drizzled with butter and jam (jelly) and served with a cup of tea! 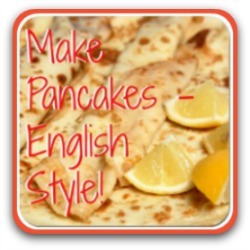 Looking for a recipe for English-style pancakes? Pancakes mean different things to different people all around the world. 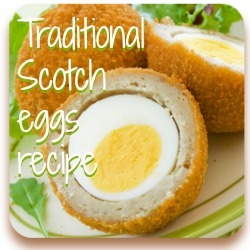 The English version is larger than the Scotch, thin and usually rolled up and eaten with lemon and sugar, or syrup. In America, it would probably be described as a crêpe. They all have one thing in common though - they all use your girls' lovely fresh eggs! 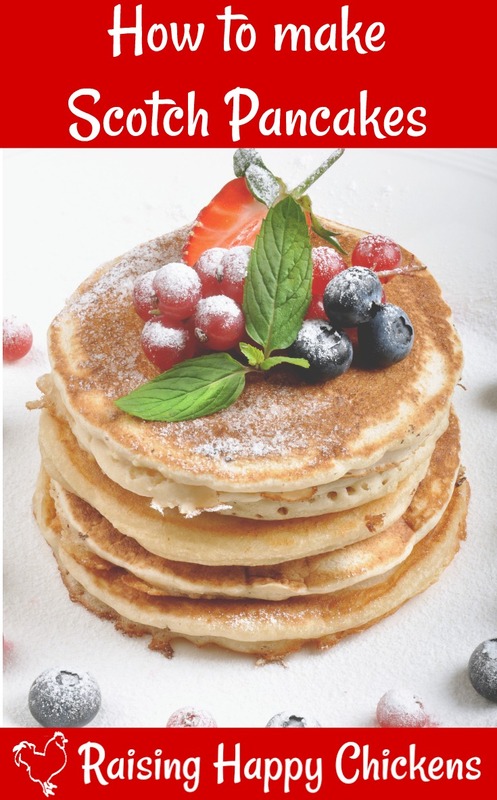 I have a recipe for English pancakes which you can see by clicking here or on this pic. 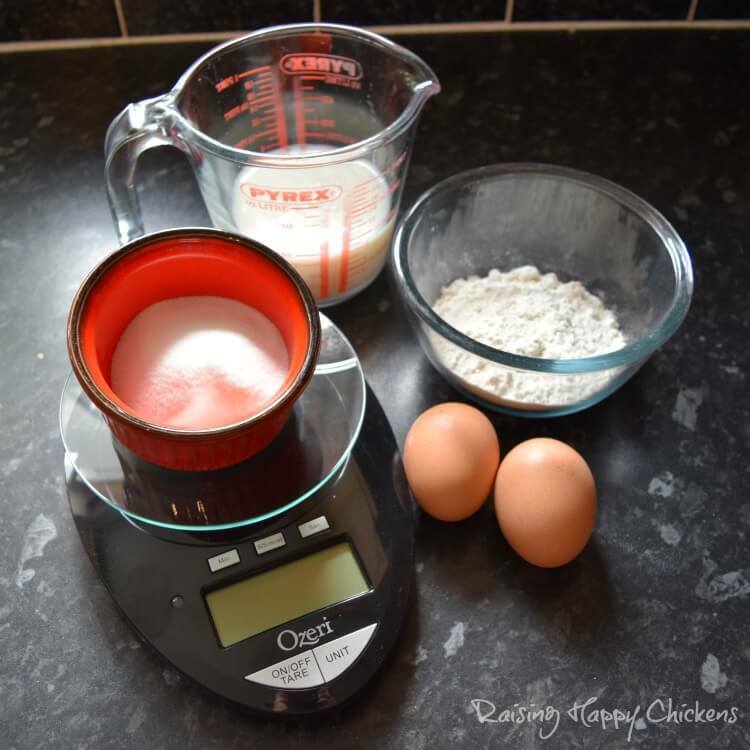 Would you like a free, downloadable version of my Scotch pancakes recipe? No problem - here it is! Clicking the green button will take you to a PDF file. You'll need a programme called Adobe Acrobat to open it. If you don't have it, just click here - it's free. 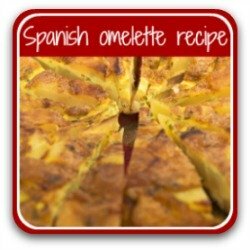 If you've enjoyed making Scotch pancakes, here are some other egg-based recipes you might like.